The Fast and Furious investigation in Congress is becoming even more fast and furious with Congressional Chairman Issa threatening a contempt citation against Attorney General Eric Holder. Last week's Friday document dump by the DoJ once again added to the widely held belief that that the AG and his minions are hiding something from Congress and the American people, but what? Each of these Friday dumps has so far provided mounting evidence that the highest echelons of federal government were clued in to this ill-fated, probably criminal endeavor from the get-go. But while we are learning more and more with each disclosure as to the how's and when's of this fiasco, we are still completely in the dark as to the why? Certainly, BATF and Justice have offered the rationale that this enterprise was designed to entrap the Mexican drug cartels by tracking weapons purchased in the U.S. to their criminal end users in Mexico. That would all sound quite plausible except for a key failing in the plan: there was no process in place for tracking the weapons once they crossed the border into Mexico. That process would have involved the notification and cooperation of the Mexican government because American BATF and DEA agents must be certified by that government to actively conduct operations within Mexico's borders. We now know for a certain fact that the Mexican government was not notified of this operation until it was blown. Furthermore, even the federal agents who were authorized to operate in Mexico were kept uninformed of this subterfuge until angry, rebellious BATF agents blew the whistle on their superiors. That everyone south of the border was kept in the dark pretty much puts the lie to DoJ's latest red herring, that Deputy AG, Lanny Breuer, suggested to Mexican officials that straw buyers in the U.S. be allowed to cross into Mexico where they could be prosecuted under much tougher Mexican gun laws. The problem with that excuse is the timeline. Breuer's suggestion was made in February 2011, well after F&F had been in full operation for many months, without that supposed strategy being proposed to the Mexican government. Now if you set a plan into motion that has no provision for achieving the stated goal of that plan, you most probably are in reality looking to achieve another goal, one that you prefer to remain hidden from oversight and exposure. Thus, if the firearms could not possibly be tracked, but our Justice Department had set up a secret arms conduit and allowed these weapons to continue to flow into Mexico, what could possibly have been the hidden agenda? Remember that this is the legal arm of the most politically leftist administration in the history of this country. Leftists are fervent supporters of gun control laws and do not believe the 2d Amendment gives American citizens the right to freely keep and bear arms. Remember as well that the chief executive, his chief of staff, his attorney general and even his secretary of state all have roots in Chicago, a city area with the most restrictive gun ownership laws in America, laws enacted by their Democrat cronies. Keeping all that in mind, recall that shortly after this administration took office, we began to read and hear with increasing frequency from these same folks that American guns were responsible for 90% of the illegal firearms being captured from the drug cartels. While this claim was patently bogus for any number of reasons, it was trumpeted by the liberal media amid resurgent calls for stricter gun controls on this side of the border. After analysis and debunking by the NRA and others, the hysterical anti-gun enthusiasts quieted their claims and the issue faded into the background. That is, until Operation Fast and Furious was blown wide open by those brave BATF agents. 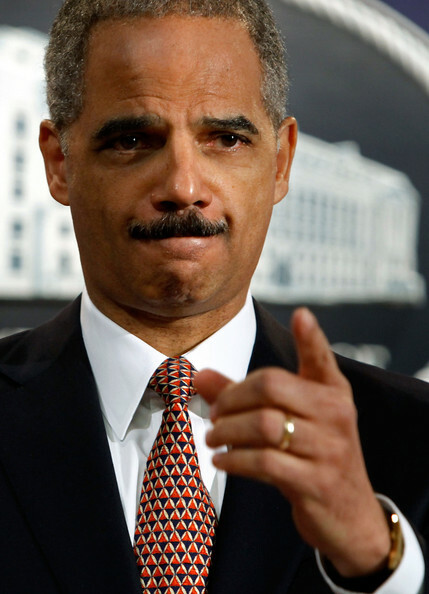 "Now Holder, without such safeguards in place, must defend himself against some very tough accusations, including one by some skeptics that the operation was intended principally to discredit, and thereby justify further regulation of, firearms dealers." Reading that, from one of the top intelligence minds in the world, has to make one wonder. Why, while diverting the claim away from himself by attributing the belief to some skeptics, did the former director of the CIA drop that bit of speculation into the mix? Do you seriously believe that a man of his stature and inside connections would raise the question purely gratuitously? Details of Operation Fast & Furious, with the revelations of all the deaths caused by this incredibly stupid federal program are infuriating enough; but they are nothing compared to the fury that will engulf tens of millions of citizens when they finally learn the truth: that the Obama Administration secretively and criminally used the Justice Department to further a liberal Democrat agenda to curtail the constitutional right to keep and bear arms. Trust me, they know and fear that reaction should the truth ever see light. Not only could that revelation prevent any chance of re-election, it could also result in multiple impeachments and criminal indictments, because hundreds of Mexicans and some American agents died as the result of a foolishly conceived and stupidly implemented liberal political scheme to undermine the constitution. Under the radar, indeed, and across the Mexican border as well; and therein lies the rationale for the furious Fast & Furious cover-up now underway.